In the last few years the general public has been bombarded and brainwashed with the supposed tremendous importance of honeybees in North America. Let’s get down to the facts. First of all, honeybees can technically be classified as invasive pests since the honeybee, Aphis melifera, is not native to the Americas — or Australia or New Zealand for that matter. The honeybee is native to Europe, Asia and Africa and in these continents, it exists in 20 or more strains all of which are compatible breeding wise. 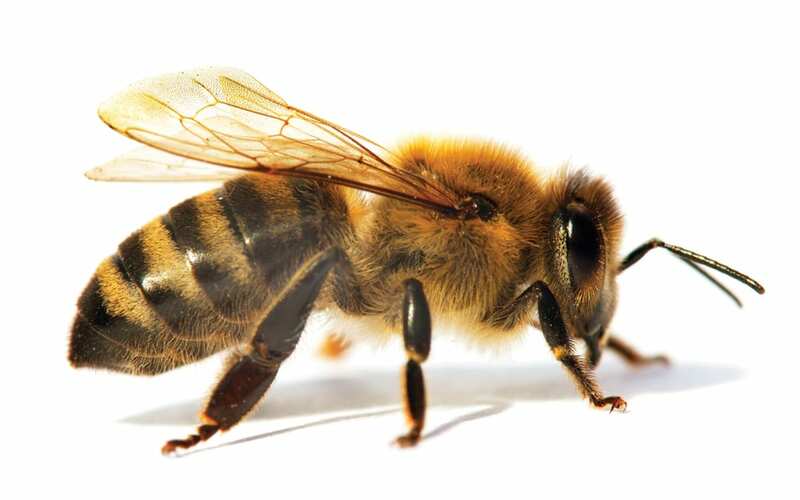 The killer honeybees that got loose in Brazil in 1957 were from Africa and have now invaded the Southern United States. As invasive pests they have, via sheer stinging numbers and allergic reactions, estimated to have killed hundreds of people. The venom of the tame (Italian) honeybee in North America, that we are familiar with, is just as potent as that of the “killer bee” and upwards of 50 people die annually from allergies to these tame bee stings on this continent. Something that’s never mentioned. Bees have been “domesticated” for thousands of years in the “Old World” as prime producers of honey. These mild Italian honeybees are now worldwide in their distribution on every continent except Antarctica. Over the years domestic honeybees have unfortunately accumulated many fungal, bacterial, viral, insect and mite pests that now infest beehive colonies worldwide. These pests and diseases certainly came from wild honeybees and likely other related species of wild bees from Australia to the Americas. Worldwide there are some 20,000 bee or bee-like species. Some 2,000 or more species of bees, syrphids (hoverlies or flower flies) and other relatives pollinate flowers in North America. Unfortunately, these many destructive pests and diseases present in beehives can kill or weaken domestic honeybees. If the bees are subject to stress, such as movement of hives or inclement weather condition such as wind, rain and cold, these diseases can be lethal. A recent paper published by CropLife International (an international association of crop protection corporations) cites varroa mites as the prime killer of honeybees worldwide. In this same document the writer lists: five major pests that included mites, beetles and moths; four bacterial and fungal diseases; and 18 infectious viruses, many of which could kill honeybees in days. The highly destructive colony collapse that can wipe out 30 to 40 per cent of bees overwintering in Canada has been linked to varroa mites and virus infections. Another factor was that pesticides used to rid bee colonies of mites could also be a major factor in colony deaths actually killing off the honeybees. When beehive colonies die out or show very poor vigour or low honey production, the easiest target to blame is not these natural causes but pesticides. In particular, insecticides. While we are fully aware that insecticides can kill bees, farmers growing agricultural or horticultural crops are generally cognizant of the beehives in or near their cropland. Bee kills are avoided when farmers are informed. In the present dispute in Europe and North America involving insecticidal seed treatment with neonicotinoids (neonics) it seems very farfetched that seed treatments of corn or soybeans in Ontario with these insecticides are killing off honeybees. How could the insecticide dust from planted treated seeds arise and infest flowers in and around cropland? The dilution on the insecticide factor alone would be huge and it would have to land on an open flower. This “story” reminds me of a problem back some 30 years ago when lindane as a canola seed treatment insecticide was banned in Canada. Scientists were finding trace levels of lindane in the blood of individuals living in Canada’s Northern Territories. It was surmised and given full credence by many scientists that dust from treated canola seed in Saskatchewan was becoming airborne and being deposited hundreds, if not thousands of miles further north finding its way into human water sources. The true answer was that individuals in the Northern Territories were using a propriety brand of shampoo that contained one per cent lindane for control of head and body lice. Beekeepers and various and sundry individuals frequently tout the extreme value of bees to our food supply as pollinators of important and essential crops. On the North American Prairies nothing could be further from the truth. While there are fruit crops, such as citrus, blueberries, cherries, almonds, plums, apples and members of the cucumber family that do benefit significantly from bee pollination, 95 per cent or more of our major Canadian prairie crops do not require honeybees. Only seed canola production requires honeybee pollination on the Canadian prairies, involving some 80,000 beehives. Almost all of the major crops grown on the Prairies, if not all of North America, corn, soybean, pea, bean, forage grass, flax, barley, oat, wheat, rye, lentil and chickpea are self- or wind-pollinated. Only sunflowers, canola, favabeans and buckwheat benefit somewhat from bees in addition to normal wind pollination and natural wild pollinators. Because honeybees do a poor job of pollination in alfalfa, we require leafcutter bees for pollination. Most trees are wind pollinated. Remember besides honeybees there are hundreds of other species of bees and pollinating flies, butterflies and moths that visit crop flowers for both pollen and nectar. Horticultural crops such as potatoes, cabbages, asparagus, tomatoes, all root crops such as carrots, beets, parsnips, etc. do not require bees or other pollinators for crop production, except perhaps for true seed production. So where does this critical need for our “invasive pest” the honey bee come from? Until the Europeans settled the Americas, honey bees were unknown on this continent and the indigenous crops managed very well, such as corn, beans, potatoes, tomatoes and squash. We repeatedly hear that two-thirds of our crops are dependent on honey bees: rubbish. What about the other countless thousands of pollinator species? Well perhaps the almond and citrus industries need honey bees for pollination. Why? Because these trees grow in virtual desserts where there are no native or indigenous pollinators due to the absence of weeds and other vegetation that would suit wild pollinators. The almond crop in the U.S. generates over US$21 billion annually on around one million acres in areas of California that has little in the way of native pollinators. As a consequence, the almond crop alone requires almost two million colonies of U.S. bees which amounts to about three-quarters of the U.S. bee colonies. U.S. citrus crops also require many tens of thousands of bee colonies for effective fruit set. Many U.S. beekeepers make most of their money not from honey but from crop pollination at around $150 to $200 per colony. In terms of total honey production, Canada produces around 75 million pounds of honey, the U.S. around 150 million pounds and China is the world’s biggest producer at some 10 times the U.S. honey crop. In Canada the Prairies produce some 80 per cent of Canada’s honey with much of the essential nectar coming from the canola crop. Prairie honey producers seem to have no problems with neonictinoids despite their use as canola seed treatments. Contrast this with the use of this insecticide on corn and soybeans in Ontario — that are not even sources of honey — purportedly affecting survival of the honeybee colonies. Reminds me of one of Shakespeare’s plays, Much Ado About Nothing or pinning the tail on the donkey. What is honey? Honey is a general aromatic bee regurgitated mixture of fructose and glucose obtained from flowers and has a calorie content of around 64 calories per tablespoon and otherwise non-significant nutrient content. Raw honey should not be fed to infants or individuals with weak immune systems since it may contain endospores of Clostridium botulinum causing illness or death. Personally, I enjoy more than the odd teaspoon of honey or honey-flavoured foods including mead (honey wine). By all means we should endeavour to do our best to foster the honey industry, but at the same time crop farmers should not be blamed for the honey industry problems. After all, it is the farming community with its cultivated fields of flowers and other flowering weeds that provides the bees with their main or primary source of nectar and pollen. Beekeepers must control the pest infestations in their hives and collaborate with responsible farmers in order to successfully maintain and profit from their industry. Honey producers, together with their bees, can then help optimize specific crop production worldwide where and when it is really needed, leaving honey as a sweet pleasurable by-product.